Our mobile app is here! Download a copy now and you’ll always be up to date. We’ll notify you with all of our important updates including when we launch new episodes of our podcast. All of our social media is now located in 1 place for your convenience. The Facebook®, The Twitter®, The Insta-blah blah blah. All of it, now located in a single app. Now’s it’s much easier to keep track of what’s up! Some of our content will be available only on the mobile app. Exclusive content! Wouldn’t that make you feel important? It should! Get the app. So, it turns out, our awesome app also works just great on an iPad or tablet or whatever label you wish to put on this device! We thought of that too. No excuses. Just get the app and be happy. We love tech and we love to tinker. We will always be updating and improving features on our fancy app. Check back often or just listen to The Podcast for news about any upcoming features for our app. 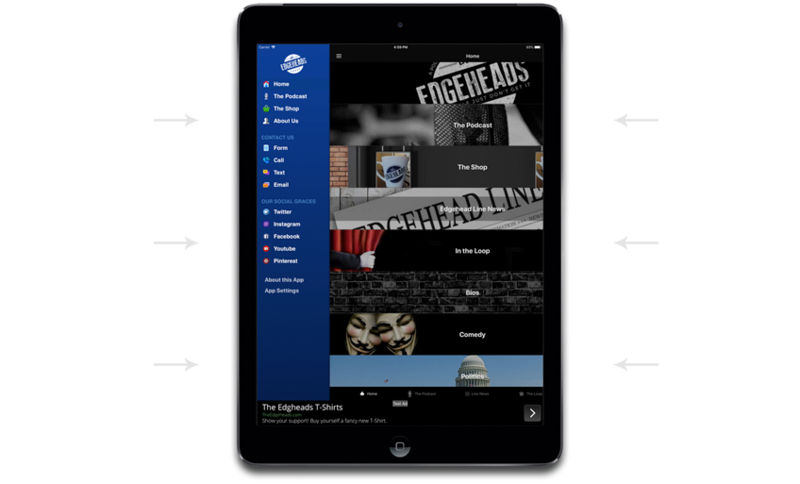 We have finished working on the Android® version and the iPhone® version of The Edgheads™ app. We will announce it to the world as soon as it’s ready for consumption from the respective app stores. Available now on the Apple® App store for only $0.00. It hardly takes up any space and it really works!